Nvidia's 2080 Ti was thought to be effectively a Titan Ti clothing, as its performance was comparable to that of the typically enterprise-targeted GPU and launched early in the generation's life cycle -- not a year later, as most Ti cards are. But no. That Ti is very much a Ti in Ti's clothing, because we've now gotten word that a new RTX Titan is actually close to release as it's been showing up in all manner of places. 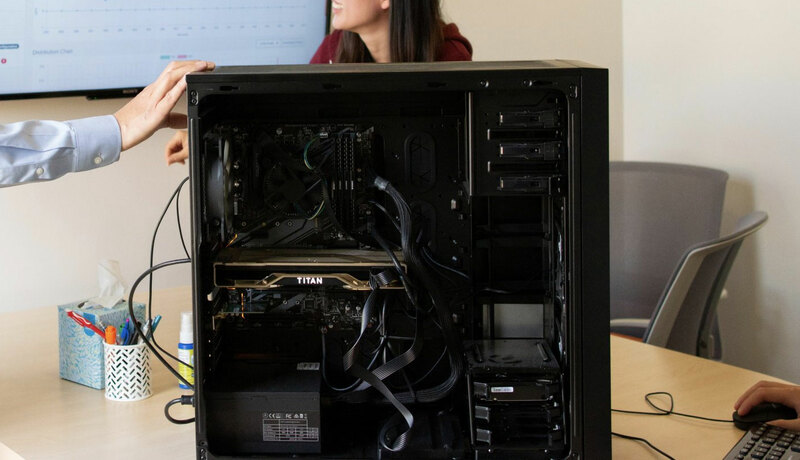 The RTX Titan first appeared in an instagram post from one of the Slow Mo Guys, while Coursera Co-Founder, Andrew NG, also posted a picture on social media with a new breed of Titan well in view. Ingore his terrible cable management and instead bask in the glory that is that gold-spangled GPU. As PCGamer points out, too, Linus Tech Tips also did a good job of "accidentally" teasing the new card by bringing the box into frame during a recent WAN Show podcast. None of this tells us anything about the card, other than that it exists. However, based on generations of the past, we can assume that the card will be more powerful than a 2080 Ti, have potentially an extra few gigabytes of memory, and, most likely considering the rest of the RTX generation, it will be ludicrously expensive. We're going to go out on a limb and guess it will launch at $1,500. Maybe that kind of investment will finally get Nvidia fans the chance to play ray tracing games above 1080P. We wouldn't count on it though. Well.... The titan rtx card is said to be 1gb vram more few extra tenser cores and a few extra cuda cores and offers a little in performance, The real question is, If the 2080ti cost £1,200, Then will people really pay £2,400. Because nvidia always makes their top end flagship cards like the titan series cost stupid prices and what is the point in buying this card if it offers only 5 - 10% for an even more insane pricing on their card line ups.